The line that made Mego famous snuck in with this one page in the 1973 catalog, along with an illustrated promise of things to come. World's Greatest Super-Heros was born in the panic following Action Jackson being taken off the air. The small company had to scramble to find a way out of an expensive problem and this was it. It is perhaps not the most vexing "chicken or the egg" conundrum the world has ever faced, but the question is: Which came first? The Mego body, or Action Jackson? Much has been made of the fact that one of Mego's keys to success was a basic body form that could be adapted for a wide variety of characters. New lines of figures could be created very quickly with costume changes, different heads (sometimes the same heads repainted)and even hands and feet when necessary. While in hindsight the concept was brilliant, the fact is that the first Mego body was created for use as Action Jackson. It is only an accident of history that when the line encountered immediate trouble it then became apparent that the bodies could be put to other uses. In Tomart's recent cover story on Marty Abrams credit is given to Stan Weston for WGSH. This is partially true, in that the GI Joe designer and industry insider was invaluable to Mego in gaining the rights to the characters, and simply getting phone calls returned. 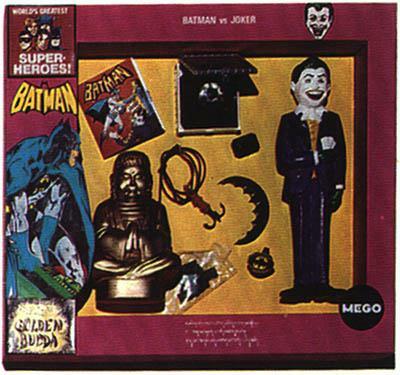 Mego was too small at the time to get the license itself, so an outside marketing/licensing firm called Leisure Concepts Industries (still in the business) was hired to approach the Licensing Corporation of America, which handled DC Comics and would soon become part of the Warner Communications empire. However, the original inspiration to use AJ bodies on Superheroes was Kublan's, and it was his presentation that convinced the Mego Board of Directors to pay the then-shocking $50,000 upfront royalty payment. A huge risk for a young company that had just suffered a major blunder. The other fear at the time was that the last Superhero line, Ideal's Captain Action a few years earlier, had essentially been a bust. Neal argued that Superheros were still very popular on television, and that Captain Action was flawed from the start by it's design. 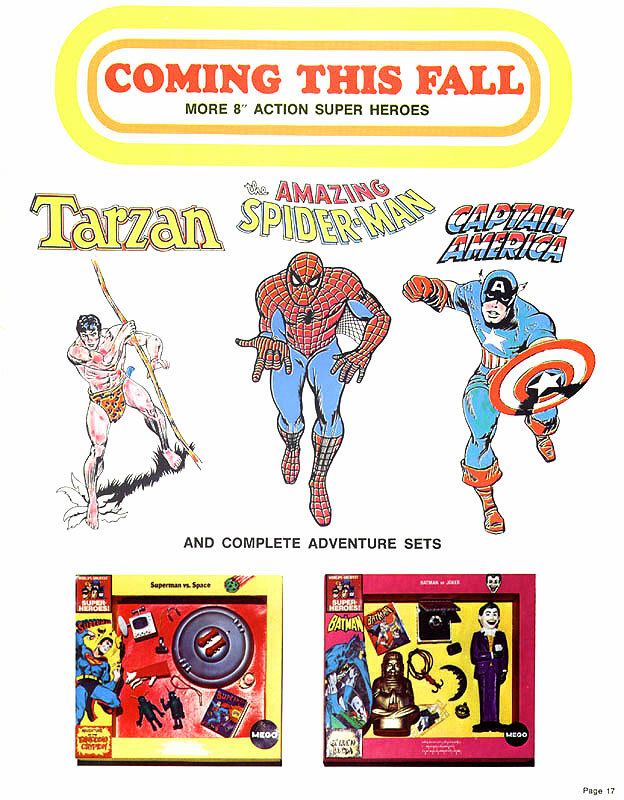 Captain Action was a single doll that could be turned into Superman or Batman by changing costume sets. Neal maintained that kids wanted several different unique figures so they could have adversarial relationships in their play, and his pitch put the idea over the top. The first tests were done in December 1972 at EJ Korvette's in Manhattan, and were an instant hit. 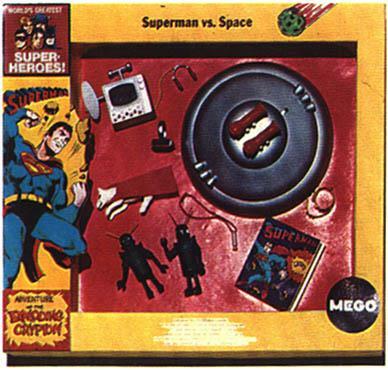 By the time Toy Fair rolled around the following spring, WGSH was in full production mode and Mego was on it's way to redefining how toys were made and sold in America. 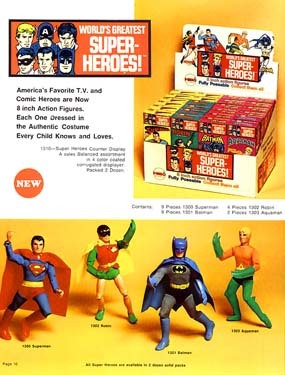 The four original heroes were sold in solid boxes as shown. The boxes were designed by Mike Jamacian, who at the time was an instructor at the School of Visual Arts. The artwork was stock DC art, though Neal Adams was approached to do original package art, but proved to be too expensive. The boxes were a disaster, as Mego was flooded with complaints from retailers that children were ripping the boxes open in the aisles to look at the figures. Turned out the kids had reason to look. The first run of Superman all came out of the factory with their insignias applied upside down. Robin initially came with a removable mask, which was ditched almost immediately in favor of a painted mask. Famously, the first run of Robin and Aquaman were factory errors with yellow fabric instead of green. It is unknown at this point whether or not ALL RMRs came with yellow sleeves and shorts, but it has become one of the defining criteria for a true, rare, expensive RMR. Nobody seems to care about the Aquaman though. Captain America and Spiderman were signed as soon as it was apparent Mego was on to something. Tarzan was signed from the estate of Edgar Rice Burroughs. The Adventure Sets below are prototypes of very good ideas that were not produced, likely due to disinterest or skepticism from retailers.